You are not a To Do List. It was a warm Sunday evening in mid-September. I was sitting on the terrace, looking up at the Sierra de Gredos, enjoying dinner and a glass (or two) of red wine with my good friend Chris Riley. 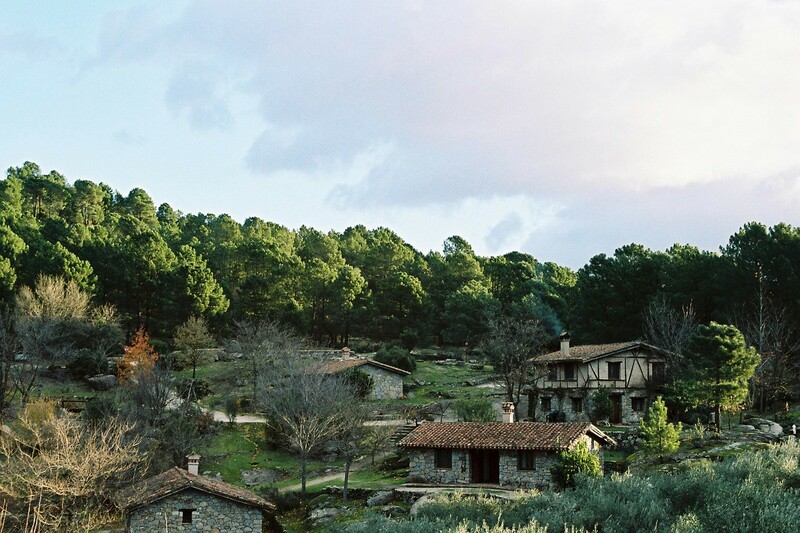 We had spent the weekend on the other side of the mountains, hidden away in an ancient house in Avila, with eight other people and dozens of books, reading and talking about what we had read. ‘I could do that every year,’ said Chris. So we did. Since I live in central Spain and Chris is in Oregon, it is hardly convenient. Yet every year, he travels over five thousand miles, for a couple of days, to do very little. Others travel considerable distances too. What is this about? It is about the power of a pause. That Sunday evening, as we sat and talked, Chris was keenly aware of how much the time-out had given him and how much he’d needed it. Hence his comment. He could feel it had affected him on many levels — physically, mentally and emotionally. He even looked different. The switch of activity and rhythm enabled him to notice and pay attention to what was going on inside him. He found he was able to reconnect with himself, as well as forge new connections with others. His sense of what mattered shifted. It was a moment of resetting, of regeneration, of new ideas and perspectives. It deepened his thinking. Time itself seemed to slow down (or open up) and he found himself ‘coming up with ideas to solve problems I didn’t know I had’ without even trying. What looked like time off enabled him to do work of a different kind. Chris recognised that this was an ongoing need, not a one-off. It wasn’t that he wanted to do it again — he wanted to do it every year. His comment was a watershed and the Reading Weekend became an annual fixture in the calendar; a pivotal point that gives shape to a year. For Chris, it is a chance to examine his own thinking from a fresh perspective, in the light of new stimulus; to give his ideas room to breathe. There is anticipation leading up to it and a period of synthesis following it. It might be just a weekend but the effects are significant. Nonetheless, it had taken me years, and a number of invitations to similar events, to get Chris to come. The idea of stopping can be simultaneously attractive and scary. Even once he got here, allowing himself this short period of undirected time was not straightforward. ‘I spent the first twenty-four hours watching my own levels of anxiety rise, because I wasn’t working on anything,’ he said. This is not unusual. The pressures and habits of everyday work and life can make it hard to pause for a few days, or even for a few seconds. A pause may be so slight that it is easy to forget, ignore or skip over. In one’s enthusiasm to forge ahead, the spaces to notice, or appreciate, or reflect, are often left by the wayside. We are all prey to this. I can easily catch myself filling in the little gaps and spaces in the day, making calls or sending emails. Yet the idea of ‘never a wasted moment’ comes at a cost. Not long ago, when my sister and her husband visited, I took them on a mountain walk. I noticed they kept stopping. Or to be more accurate, I noticed that I had stopped stopping. I often walk on my own, so walking in company made me realise that, over time, I had become almost entirely focused on getting to the top, taking pride in how quickly I could do so. The walk had become a goal to be achieved, rather than an experience to be enjoyed. Yet why bother with a mountain walk if you never pause to take it all in? I was missing the point as well as the view. How often do we do something like this? For example, our children can easily become just a stream of endless tasks: feeding, dressing, getting them to school or football practice or dance class, doing homework, bedtime story and so on. In the midst of all that, do we allow ourselves time to actually be with them, to enjoy them? Do we give them the time to be childlike, or are we so focused on having them notch up another achievement that they miss out on the ‘view’ along the way? In general, we don’t pay much attention or give much importance to the spaces in between all the tasks. I think we should. In life, as in art, you need to step back to see that. The ‘negative space’, which lies around or between objects or events, gives shape to the whole. It is easy to miss this. The space in our lives is always under pressure. There are powerful forces that combine to squeeze it out. First among these is technology. Machines work well at a constant speed — and the faster the better. They are designed and built for it. Whether they are spinning cotton or crunching numbers, regular, repetitive actions are what they excel at and, increasingly, our world is designed by machines, for machines. Yet what works well for machines doesn’t work well for people. 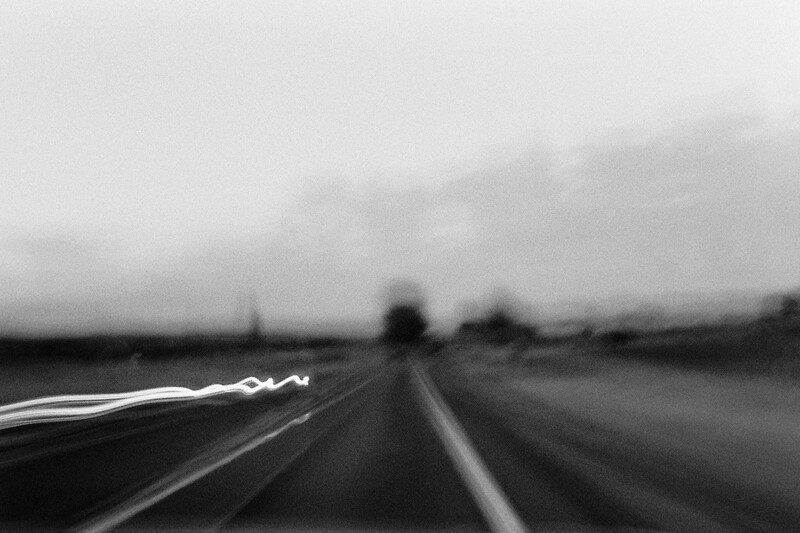 Overwork, or constant work, can be a means of escaping ourselves. It covers a yawning well of anxiety about what might happen if we were to stop. We are fearful of what we might discover. If we are not ticking things off our to-do list, then who are we? Faced with that anxiety we try to keep calm by carrying on. We convince ourselves we are indispensable and exist in a state of ‘continuous partial attention’ where we are constantly interrupted but never consciously pause. To pause becomes taboo. Without a pause, everything continues as it was. Even something as mechanical as changing gear in a car is smoother when you add the tiniest of pauses in neutral, between gears. Pausing is part of living and breathing. Indeed, between breathing in and breathing out, there’s a pause. The purpose of having a break isn’t only to rest, important though that may be. In a pause you can question existing ways of acting, have new ideas or simply appreciate the life you are living. Without ever stopping to observe yourself, how can you explore what else you might do or who you might become? If you always head on relentlessly, where is the room for the heart? As well as the cost to our health or sanity, there is the cost of what you miss along the way. Fail to pause and you miss out on the view, or the path not taken. What’s more likely to get your kids to talk to you: questioning them or allowing them some space? With no pause (or silence) in a meeting, you may rattle through the agenda, but fail to tackle the underlying issues. What other more creative, more powerful conversations might you have, if only you were able to let a bit of daylight into the process? What deeper questions might be raised? What other voices might you hear? As you bowl along, are you really thinking or are you just reacting? Is packing more in really the way to do your best work, or to get the most out of life? The kind of work we do and the nature of the problems we face require more pause, not less. As journalist Carl Honoré says: ‘Many modern jobs depend on the kind of creative thinking that seldom occurs at a desk and cannot be squeezed into a fixed schedule.’ A similar argument applies on a global scale. A pause is an opening. It acts as a portal to other options and choices, giving more dimension to your experience. Just as a small amount of yeast makes light of heavy dough, a small amount of pause here and there can leaven or lighten your life. You don’t need much but it is a vital ingredient. Experimenting with pause gives you a way to play around with the rhythms of your life. It gives you a way to give shape and texture to your experience, weakening the sensation that your life is driven by external forces over which you have no influence. Choosing where you put your pauses makes an enormous difference to what your life feels like and what you can do as a result. You might pause to rest and regenerate, to become more creative, to connect with other people or yourself, or just to enjoy whatever it is that is going on around you (or inside you). There are many possible reasons to pause, ways to pause and lengths of pause. There are many different practices you can adopt. You can play around to your heart’s desire and choose whatever suits you: pause is quite the opposite of a task to tick off. Pause is a very plastic concept. There is plenty to try, as I explore in my new book. It is a subtle, powerful, life-giving idea — one that is worth spending a little time with. 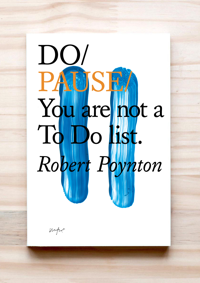 Extract from Do Pause: You are not a To Do list by Robert Poynton. Text © Robert Poynton 2019. Photography © Jim Marsden. Published by The Do Book Co.